Lose 5-15 inches with Body Wraps! The Aloe Vera Collagen Enriched recipe which has been enhanced with Vitamins, Minerals, and Amino Acids, is our signature body wrap formula! This body wrap formula is 95% pure aloe vera enriched with collagen. Aloe vera is a main ingredient of most new products introduced to the salon and spa market today and is considered one of the top 10 most healthy products by consumer publications. aloe vera collagen enriched formula. 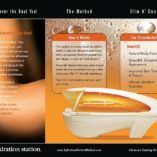 We have been creating our three special aloe vera formulas for over 20 years for exclusive spas around the USA and now offer these same recipes to the general public. The Aloe Vera Collagen Enriched recipe is our signature wrap formula. Contains 95% pure Aloe Vera enriched with collagen.